Lately I have been getting a ton of followers that are Twitter Spammers. It is really annoying. They follow you then spam you with DM's about their "awesome" website. They follow Thousands of people and have multiple accounts. I'm not a fan of this and I really hope Twitter gets this under control. Twitter has been acting crazy lately but this was really interesting. 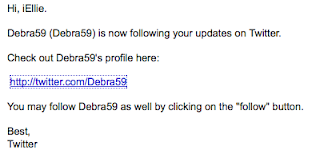 I just got an e-mail from twitter saying I had a new follower. I was not excited because I was pretty sure it was going to be another Twitter spammer of doom. I was wrong. So, now I'm not only getting Twitter spammed I'm being followed by Ghost Twitterers? Creepy! I got this same email today from Twitter, these ghost accounts are weird. 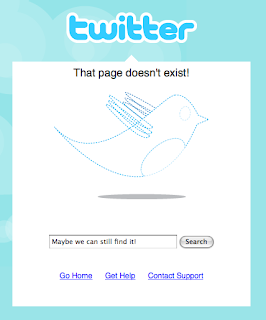 Maybe the accounts are being shut down before we can get to their profile? Who knows!